You’ve heard of tracing a kid’s hand to make a Thanksgiving turkey, but how about a footprint? 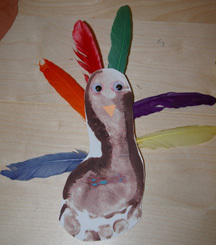 This craft is a great activity for preschoolers as well as a keepsake for parents. What You Need: White butcher paper or construction paper; nontoxic brown paint; 2 googly eyes; scrap of orange construction paper; 6 colorful feathers; glue; tape; paintbrush; scissors. How to Make It: Brush paint onto child’s foot (this generally works a little better than having them step in the paint, but that’s fine, too.) Have child step on white paper without wiggling, and then pull off in one motion. Let dry. Cut out foot shape. Glue on googly eyes and orange triangle beak to heel. Attach feathers to back with glue or tape. This entry was posted on Sunday, November 15th, 2009 at 5:29 pm	and is filed under handprint and footprint crafts, Thanksgiving crafts. You can follow any responses to this entry through the RSS 2.0 feed. Responses are currently closed, but you can trackback from your own site.